John Hermann Pappe the second son of Gottfried Wilhelm Pappe and Johanna Catharina Heinemann. He was born in Stotternheim (near Erfurt), Germany in 1852 and emigrated to America in 1872 at the age of 17. At least two of John Pappe's four brothers also emigrated to America — Richard Pappe Sr. and Albert Ludwig Pappe. John lived in Illinois, Missouri, Kansas, Colorado and finally Alaska, where he froze to death in 1903. He married Mary Drayer and had one son. John was a baker and occasional miner. We have no known photos of John H Pappe. However, we have one unidentified photo that we believe may be him because the man in the photo bears some resemblance to Richard and Albert Pappe. 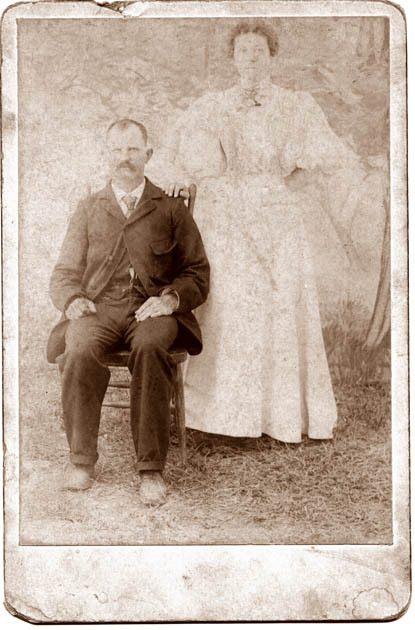 We believe it was taken in the midwest in the early 1890 period, based on the photo process and the woman's clothing style. John Pappe would have been 38 years old in 1890. If you have any photos of John Pappe, please contact us.